Have you ever considered the politics of water? Grantham Scholar Naomi Oates studies the values and everyday practices of different actors involved in water supply. 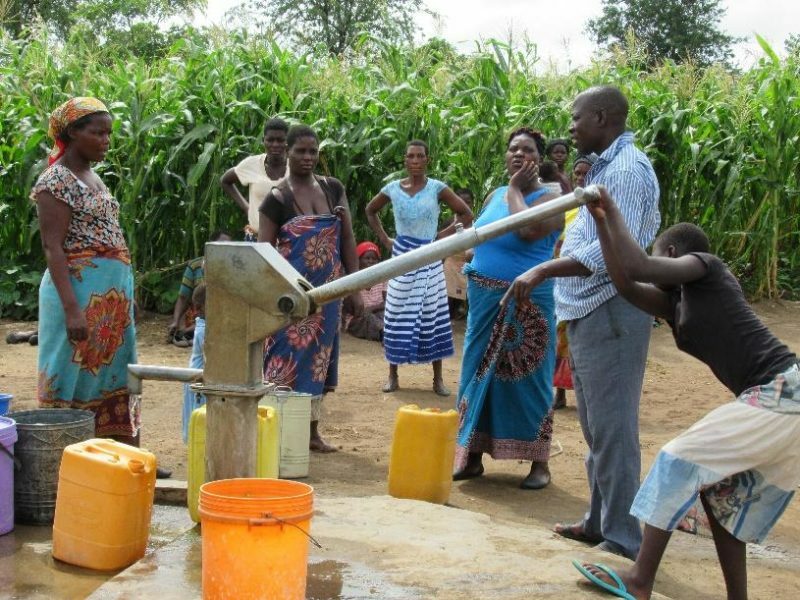 As part of this research project, Naomi has undertaken fieldwork in Balaka, Malawi, and here she reports from back on what she has discovered about how politics and water are intertwined. 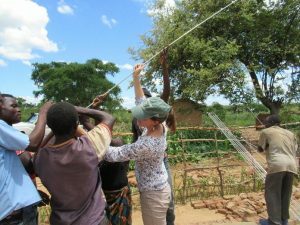 In November I wrote a blog describing my first impressions of life in Balaka, Malawi, where I am doing my PhD fieldwork. To recap, my research concerns the sustainability of rural water services. I am particularly interested in the role that actors at the district-level play in developing and, crucially, maintaining these services. Several months on, I am starting to make sense of my experiences shadowing extension workers in their day-to-day work. What strikes me is how these actors have to navigate competing interests and find creative ways to get their jobs done. In this blog I focus on their relationship with communities (service users). How do extension workers secure cooperation from communities? In my conversations with government and NGO staff, it was evident that the ‘community-based management’ (CBM) model for water governance is not only enshrined in national water policies, but has become deeply embedded in development practice. CBM means that while government or other external agencies may provide the infrastructure, responsibilities for day-to-day management lie with communities. In other words, communities are expected to look after the water point and cover the costs of repairs. Extension workers play a supporting role, providing training, monitoring and technical advice. This approach is meant to empower service users and ensure that services are more efficient and effective. As the opening quote illustrates, extension workers have internalised key elements of the CBM model and this does inform their decisions, whether consciously or unconsciously. But policy implementation also entails negotiation. Extension workers have to mediate between the demands of formal policies and government institutions, the interests of communities and their leaders (which are not homogenous) and the influences of other actors such as NGOs or politicians. In this respect, policies on paper are often an inadequate guide to action. 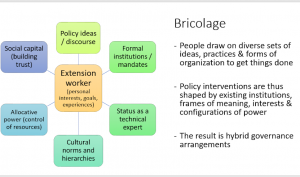 I find the concept of bricolage (Cleaver, 2012) useful to understand how extension workers navigate between these different interests, drawing on a variety of resources. The bricoleur is a kind of amateur handyman, making do with the tools available, whether old or new. This might include formal and informal institutional arrangements, social relations or networks, material and financial resources, ideas and technologies, and so on. The result (policy in practice) is often a hybrid. How is an extension worker a bricoleur? Firstly, my research participants tend to see themselves as a bridge between state and citizen, not only representing their Ministry but also communicating people’s needs to the District Council and development partners (donors/NGOs). In carrying out their roles, extension workers shift between ‘insider’ and ‘outsider’ positions, drawing on social networks, their status as government employees, and cultural norms. The insider: Often extension workers are not originally from the areas (or ethnic groups) which they currently serve, hence they have to make an effort to gain and maintain trust from communities. They do this primarily through the development of personal relationships, in other words building social capital. For example, participants talked about stopping to drink beer or attending funerals as an important part of their job. The outsider: Extension workers are afforded a certain status vis-à-vis community members in recognition of their technical expertise and as government employees. Government employees can also leverage support from local leaders such as village headmen who are expected to facilitate policy interventions. Cultural norms play a role in reinforcing these relationships. Hierarchy is accepted and less powerful people tend to depend on more powerful people, whether traditional or state elites. In rural contexts of Malawi, these hierarchies can undermine community self-help as ordinary people tend to wait for orders or assistance from ‘above’ and rarely question the activities of their ‘betters’. This might give extension workers a degree of authority but clearly has disadvantages for a CBM model aimed at citizen empowerment. Secondly, cooperation from communities is by no means guaranteed but is essential for CBM to work. Extension workers do meet with resistance, and express frustration when community members make their task difficult. For example, a common problem is the collection of water user fees, which in theory provide the funds needed for water pump repairs. People will often assert they cannot afford to pay, labelling themselves as ‘too poor’. Extension workers employ several strategies in dealing with resistance. The first is evident in the quote above, namely reiterating key elements of the national water policy. 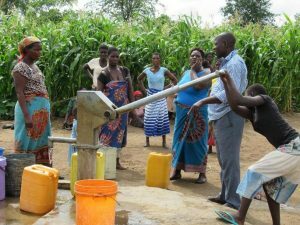 Communities are reminded that they have responsibility for managing the water point and raising funds for its maintenance. It is emphasised that they are the ‘owners’ of that water point. Moreover, if they do not take action there are consequences – they will not have water. Another strategy is to enlist the support of the village headman, for example calling a meeting in which a problem is discussed communally and a solution agreed. This seems to be an effective way of securing consensus, at least verbally. Extension workers can also resort to threats, for example removing the handle of the pump (effectively cutting off the water supply) until the community has complied. For new projects, the infrastructure can be built in a different village, one where the community is more willing to cooperate. However, antagonistic strategies are a last resort and consensus is generally preferred. To sum up, extension workers play a crucial role in translating policy into practice, operating at the interface between state and society. 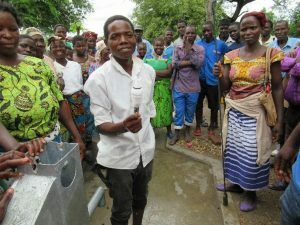 Shadowing individuals in the field and getting involved in community training and water points repairs is helping me to better understand what this means in reality. I have seen, first-hand, the constraints the water office faces in terms of financial and material resources and their consequent reliance on other actors (particularly NGOs) to deliver services. At the same time, I have come to appreciate the dedication and creativity with which extension workers carry out their work and engage with communities. Being a bricoleur is certainly necessary to ‘get the job done’ in rural Balaka.